Jedi Mind Tricks definitely goes under the "I've heard of them, but never really got into them." Mainly because I didn't take the time to know them (so bittorrent here I come... j/k Austin Hip-Hop Scene advocates supporting your artists ;) ... but I'm still goin' to the show if I can! Jedi Mind Tricks comin' to Emo's Lounge on Oct. 19th. At the show will also be R.A. the Rugged Man, Outerspace, and our very own Dubb Sicks. Still recovering from the weekend... hope ya'll had a good one! Jedi Mind Tricks (JMT) are an underground hip-hop duo from Philadelphia. 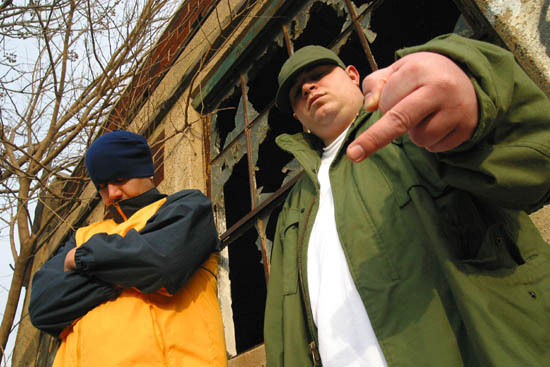 The duo is composed of high school friends Vinnie Paz (born Vincenzo Luvineri, formerly known as Ikon the Verbal Hologram) as rapper and Stoupe the Enemy of Mankind (born Kevin Baldwin) as producer and DJ. The group is known for Stoupe's unique production and Vinnie's edgy — though often blatantly offensive — lyrics, as well a long list of collaborations with both regional underground peers and rap veterans, including Kool G Rap, Heltah Skeltah, Ras Kass, Canibus, Killah Priest, and GZA.